‘I’m not talking about right, I’m talking about staying alive,’ says Cody. Earlier, at the beginning of ‘Comanche Station’, Cody had rescued Mrs Lowe from the Comanche. Mrs Lowe has a reward on her head and, after a Comanche attack, Cody is obliged to ride with Ben, Dobie and Frank. The leader of the trio, Ben, is interested in the $5000 reward and is prepared to kill Mrs Lowe and Cody to claim the money. Much has been written about the complicated morality that exists in the Westerns of Budd Boetticher. But the critics too often confuse morality with a code of honour. The heroes played by Scott are flawed but Scott possesses a humanity that the charming villains lack. Scott is not prepared to sacrifice the woman for money. Pernell Roberts in ‘Ride Lonesome’ is the exception amongst the villians. In that movie, Roberts is a man who has merely made mistakes, which is why there is no final duel between Scott and Roberts. But if Scott has a humanity that the villains normally lack, his adversaries subscribe to the code that ultimately makes a man worthwhile. The code is essential. The villains need the code to believe in their own worth. It also sustains our interest in the movies. Without the code of honour, the villains would not be worthy opponents of Scott. The films of Boetticher appeal because although not romantic they persuade the audience that there was a time when we were stronger and relied on a code of honour rather than a code of practice. 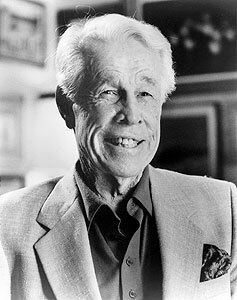 Boetticher suggests morality is beyond human understanding. But despite that inadequacy men observed a code of honour and the best like Scott had humanity. Today, to quote Ben in ‘Comanche Station’, we run more ‘on the gentle side’. The best we can have is a code of practice. Honour is different, it is about ‘amounting to something’ and it is rooted in strength and survival. It is what men passed on to their sons to help them endure. Weak men hated themselves and perished. 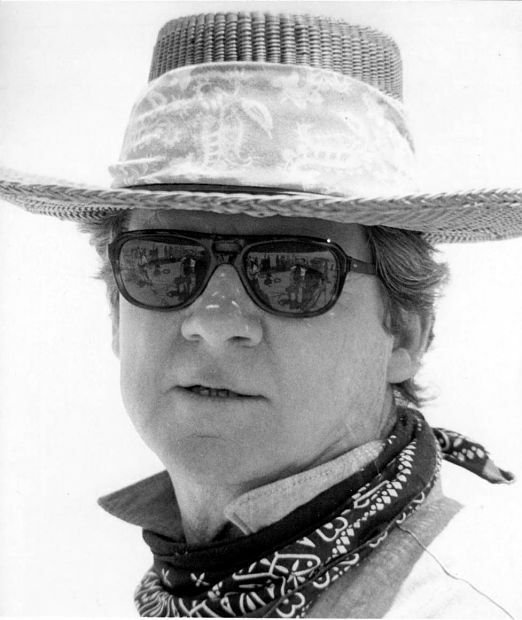 Boetticher is important because he made great Westerns. Talent was important but he also understood how the world had changed and he grasped the distinction between honour and morality. Film critic, Andre Bazin described ‘7 Men From Now’, another close contender for the best Boetticher Western, as ‘the most intelligent Western I know and the least intellectual.’ The villains in movies of Boetticher are interesting and entertaining, even sympathetic. But they are nowhere near as complex as alleged. They have a code but, apart from Roberts, lack humanity. This is why the villains are unable to walk away from the final duel with Scott but can easily sacrifice others. In ‘Comanche Station’, Ben rides to the rescue of Cody against the Comanche. Ben explains he wants to enjoy the money with a clear conscience. Ben is not concerned about the fate of Scott who he is willing to kill later but his own prospects. He wants to feel he deserved the money. These men have a strong sense of themselves. It is required for them to survive the landscape. Undoubtedly, male narcissism is in there but they are more than that. Otherwise, the women would be more important than the money and, although the villains desire love, money will define their existence much more than a woman. A good woman provides comfort but women make their men similar to others. Money can make men different and important. The critic, Andrew Sarris, has described the films and the conversational fencing as ‘poker games’. If the competition of a poker night between men establishes short-term hierarchy, it also supports long-term comradeship. Cody is different because he has humanity, but he still shares the code, which is why the campfire chats between Scott and his protagonists are usually so relaxed. Mrs Lowe says she does not believe that Cody did not know that there was a reward for her rescue. Cody says, ‘I didn’t think you would.’ Like Ben, Cody is concerned about himself and his honour, not what Mrs Lowe thinks. The best Boetticher movies are those written by Burt Kennedy. The movies written by Kennedy always have scenes set in a lonely landscape, often the mountains and the desert. Boetticher is at his best when he puts his characters out in the open. In ‘Comanche Station’, Ben defines the land as ‘nothing but empty’. But it can offer pastoral peace and this, with the help of lovely music, is evoked brilliantly when the group rides through the occasional gentle green countryside. The landscape suddenly encourages kinship between the members of the group. Elsewhere, the landscape with its narrow gorges and challenging steep rocky climbs is a perfect setting for a conflict that will only be resolved through violence. This contradictory quality that we find in the landscape is echoed in the writing of Burt Kennedy. His scripts are black comedies disguised by the direction of Boetticher and earnest rugged performances. The plays of Yorkshire playwright, Alan Ayckbourne, are fascinating because they can be either performed as gloomy dark tragedies or comic farce. The work of Kennedy is the same, which is why, after making the films with Budd Boetticher, Burt Kennedy became successful making comic Westerns. Because the Boetticher films are intelligent we are drawn inevitably to analyzing the content. 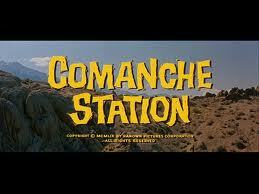 ‘Comanche Station’, though, is a joy to watch. Critics invariably describe the films as lean but this is not accurate. True, the scripts are spare. Scott reveals so little of himself in ‘Station’, it requires other characters to provide detail about his nature. The Boetticher films, though, are leisurely. The plots are simple and we are given time to wonder about these taciturn individuals. We observe how they fit the landscape and the way they treat their animals. Boetticher was a master horseman and this is evident from the films. In European literature, suspense was often added by the need of the hero to change horses on his journey. In the Western, the horse is usually seen as a constant companion, a friend. The heroes of Boetticher are more practical and usually own spare horses. In ‘Comanche Station’, the group trails four horses and three mules. In the same way he alternates landscapes, Boetticher uses horses in different ways. In some scenes, Scott rides his horse as if he is taking part in a gentile equestrian contest. Others, the men push the horses and gallop. These men, though, rarely work without being aware of the contribution of the horse. When Scott has to endure pain he yells like an injured mule. No doubt, some will find the final scene a little crude and the actor who plays the blind husband does not help. The scene, though, is important. For much of the film, the men are occupied by ambition and worth. Ben understands his obligations and, consequently, his fate. ‘Even if I had to die in the doing,’ he explains. But if the men are preoccupied with themselves and each other there is an unresolved mystery that haunts the film. We do not know if Cody is roaming Comanche territory looking for his lost wife or for a woman like Mrs Lowe, who, as he says, ‘will help me forget, even for a little while.’ Either way, as the final scene makes clear, Cody is obliged to search. The final shot has Scott in the same rocks as we saw at the beginning of the film. He is still searching, still roaming. It will be his life. He is a man whose regret is now indistinguishable from hope. Cody, even without money, is different. Hmmm! Yet another really interesting piece which does challenge my views on the ‘boys own’ cowboy myths and legends. I’ve yet to be fully convinced that such a code of honour existed in reality but nonetheless, can appreciate Howard’s approach and have enjoyed watching this film on more than one occasion.